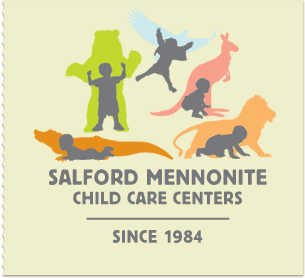 Salford Mennonite Child Care Centers » Ealy Childhood Education » Imagine. Play. Learn. Since 1984.
http://www.youtube.com/playlist?list=PL5EAF0A94DB28F4DD The Salford Campus participated in PA Promise for Children and asked the children, “What do you want to be when you grow up? Congratulations! SMCCC has acheived a new, five-year term of NAEYC Accreditation by successfully completing the renewal process. The administration, teaching staff, and families of Salford Mennonite Child Care Centers are all to be congratulated for continuing to uphold the mark of quality represented by the NAEYC Accreditation system. On behalf of NAEYC, and specifically the NAEYC Academy for Early Childhood Program Accreditation, we commend your program’s outstanding efforts in renewing NAEYC Accreditation. The Association for Childhood Education International, a member of the World Forum Alliance, is promoting Ten Pillars of Good Childhood as the basis for their “Decade for Childhood” campaign: 1. Safe and secure places for living and learning and access to health care, clothing, and nutritious food. 2. Strong families and loving, consistent caregivers. 3. Social interactions and friendship. 4. Creative play and physical activity. 5. Appreciation and stewardship of the natural environment. 6. Creative expression through music, dance, drama, and other arts. 7. Education that develops the full capacities of the child — cognitive, physical, social, emotional, and ethical. 8. Supportive, nurturing, child-friendly communities. 9. Growing independence and decision making. 10. Children and youth participating in community life.